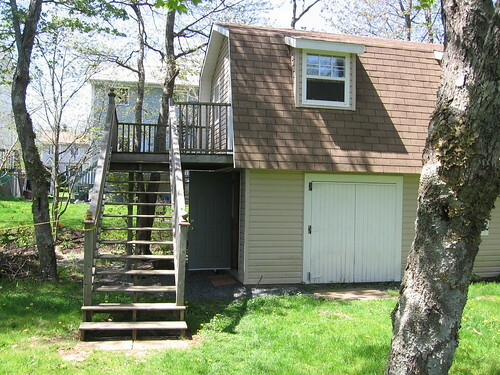 The shed in our back yard is big and sturdy, but you wouldn't know it by looking at the stairs heading to the upper deck. The posts holding up the deck have sunk into the earth over the years, with the front one sinking further than the back one. 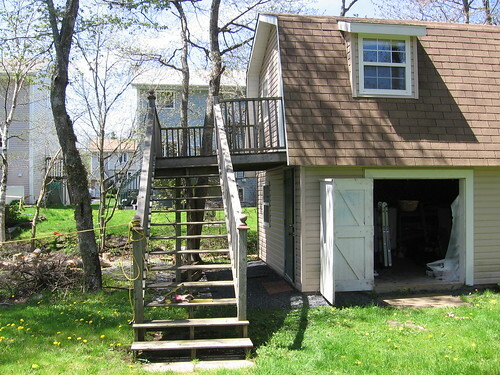 The deck looks crooked and decrepit - the stairs end up cockeyed and wobbly. It makes the deck look like a rickety shack by association. The obvious solution is to fix it, right? Well, fixing a sinking deck is not an easy chore for someone without handyman skills or tools. Lucky for me, my dad came for a visit. We took a 2x4 stud and screwed it to a joist on the underside of the deck. Two deck screws secured the top end of the stud to the deck frame. We dug a hole at the base of that stud and put a jack in the hole. This was no little car jack -- it's a heavy, solid piece of gear called a Jack-All. It's a few feet tall with a long handle for leverage. I had to dig another hole beside it to let the handle swing far enough to work the jack. The jack pushed up the stud, and the stud raised the deck. We kept jacking up until both deck posts were off the ground. The deck blocks under the studs were dug out of the mud and we filled the holes with gravel and packed it down. It took some measuring and additional trial and error to find the right level for the gravel and deck blocks, but it paid off. Eventually a spirit level placed on the top deck proved what we were able to see: the deck became level! It's not entirely obvious here, but the stairs are level, the deck is level and the posts are true. All in all, it took about half an hour. 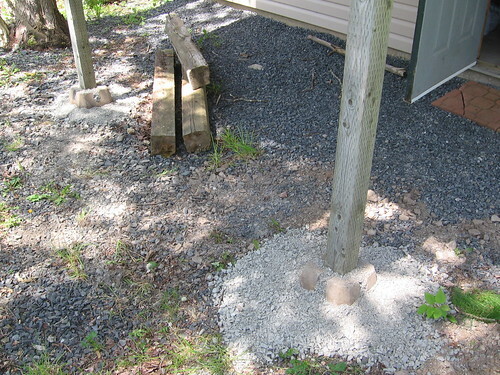 To finish it off, I put more gravel at the base of the footings in case it settles more. This could also help with runoff. The last step was moving the stairs over. Yup, they'd shifted and warped over time, and whoever placed the patio stones at the bottom did so after the warping. Now that they're straight, the patio blocks had to be moved to the left about four inches. Now the shed looks like it has respect for itself. It stands tall and proud and looks every bit as sturdy as it is. Big thanks to my dad for his wisdom and work in getting this project done!